Under the theme 'Connecting Africa’s Resources through Digital Transformation', the 26th World Economic Forum on Africa will convene regional and global leaders from business, government and civil society. They will discuss technological catalysts that can drive radical structural transformation, strengthen public-private collaboration on key global and regional challenges, and agree on strategic actions that can deliver shared prosperity across the continent. The meeting takes place from 11 to 13 May in Kigali, Rwanda, and below you will find instructions on how to follow #af16 via our social media channels, how to embed live broadcasts, and how to access the photographs taken during the event. ‘Like’ our Facebook page, where we will share data, news and views with our 1.1 million followers at http://wef.ch/facebook. We also have an official Facebook page on Africa for regional updates. Spanish speakers can also follow our Foro Económico Mundial Facebook page for content from our Spanish blog. We invite you to follow the World Economic Forum on Twitter @wef (over 2.86 million followers) and @davos, our live tweeting account, where we tweet key quotes from official plenary sessions and where most of the Twitter chatter will happen. You can also follow our Global Shapers community and their campaign to make the benefits of the internet available to everyone, #Internet4All. During the meeting, we will be publishing articles by some of our participants, CEOs and industry leaders on our content platform Agenda. You are welcome to republish the articles, providing you credit the World Economic Forum and link back to the original. 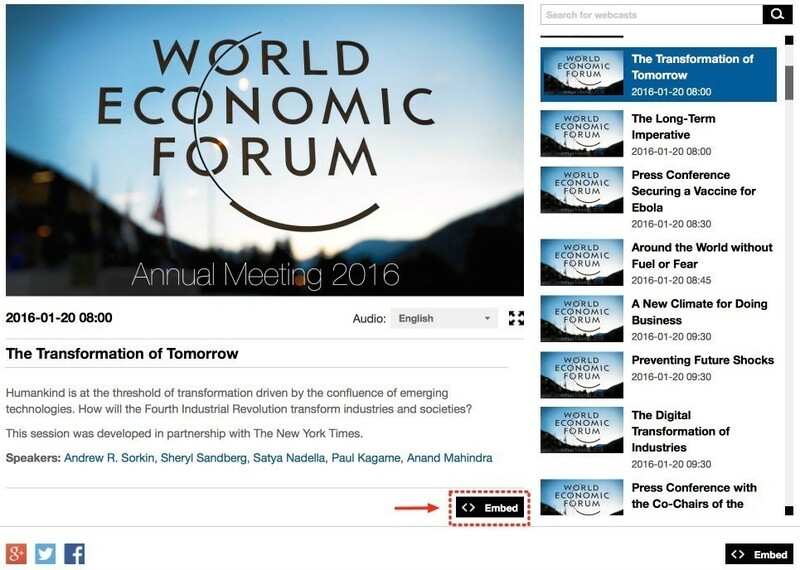 Key sessions and press conferences will be broadcast live as webcasts at http://wef.ch/af16. Want to have the full list of webcast sessions, containing embed codes, times and dates? Click here. Add the full livestreamed programme to your website and the videos will start automatically once the sessions start. The videos will start playing automatically once the session starts. Once the session finishes, it will take a few minutes for the session to be available on demand. The same code will play the video on demand once it's ready. A selection of the best pictures taken at the Africa meeting will be made available free of charge under the creative commons licence (cc-by-sa) on Flickr at http://wef.ch/af16pix.